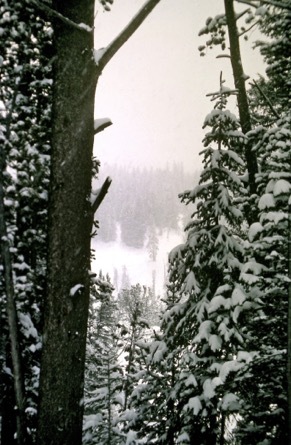 As this photo illustrates, sometimes Winter in Wyoming can hang on late into the "Spring" months, especially in the upper country. Typically, Winter loosens its grasp in April, but sometimes it holds on until May. I wonder what it will do this year? When the tour group was staying in Hong Kong, we took a bus to the border of China. 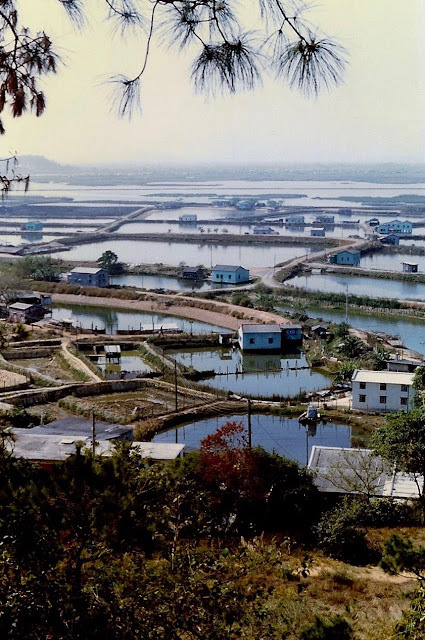 We did not go into China, but from a hilltop we had a good view of the farms along the border. I'm fairly certain that these are rice fields. Yes, that is smog on the horizon in 1979. I can only imagine how much thicker it is now. A photo of me standing at the border can be seen in this post. This display was in the corner of the school house building on the museum grounds, and it was the coal bucket, not the stove, that brought back memories of my childhood. 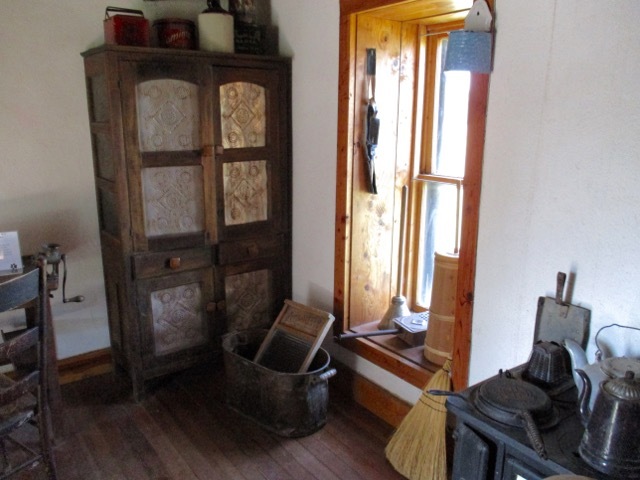 The farmhouse was heated with a Stokermatic for most of my childhood, and one of my chores after school in the winter was to haul coal into the house - two buckets at a time to fill the hooper at the end of the stove. 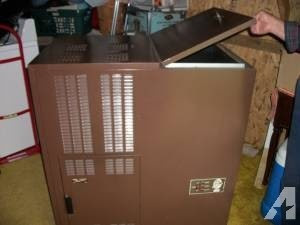 The photo shows a similar model. The raised lid shows where the coal was dumped into the stove. 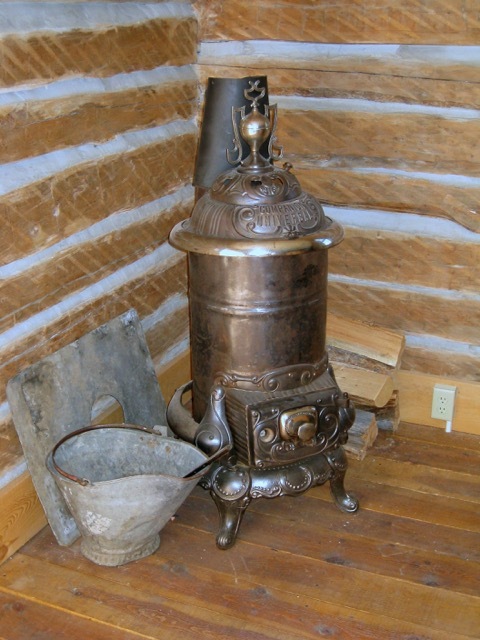 An auger pulled the coal into a burn chamber which had a double door on the front of the stove. The door dropped down to reveal a metal bin where the coal clinkers were placed and a thick metal door that opened into the burn chamber. The clinkers were cleaned out of this chamber with a special claw like device and placed in the bin a couple of times a day. When the bin was full and cool, it was my job to empty it near the garden. I loved to lay in front of the stove and do my homework or simply take a nap. Sometimes I even sat on top of the stove. The stove did not work well when the electricity was off because the auger was electric. Coal was purchased locally from a dealer near Burma Road: the place now sells fireworks. When I was in high school, the Stoker was replaced with a natural gas stove, and my coal hauling days were over. That museum coal bucket contained a lot of warm memories. The Winter Carnival Quilt Show is an opportunity to see some gorgeous quilts, and this year's show did not disappoint. 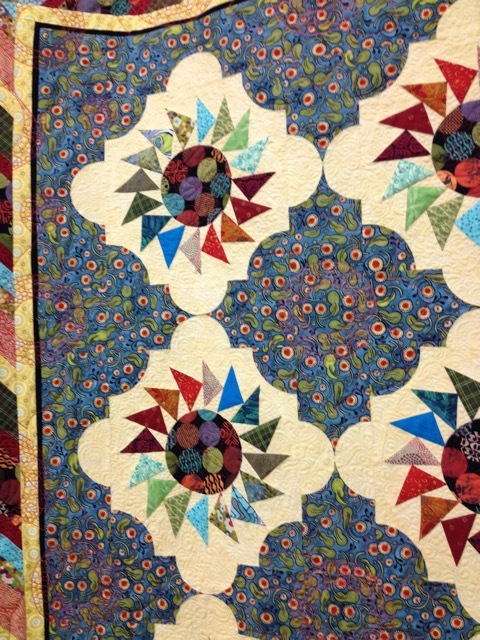 I love to see how quilters use fabrics. 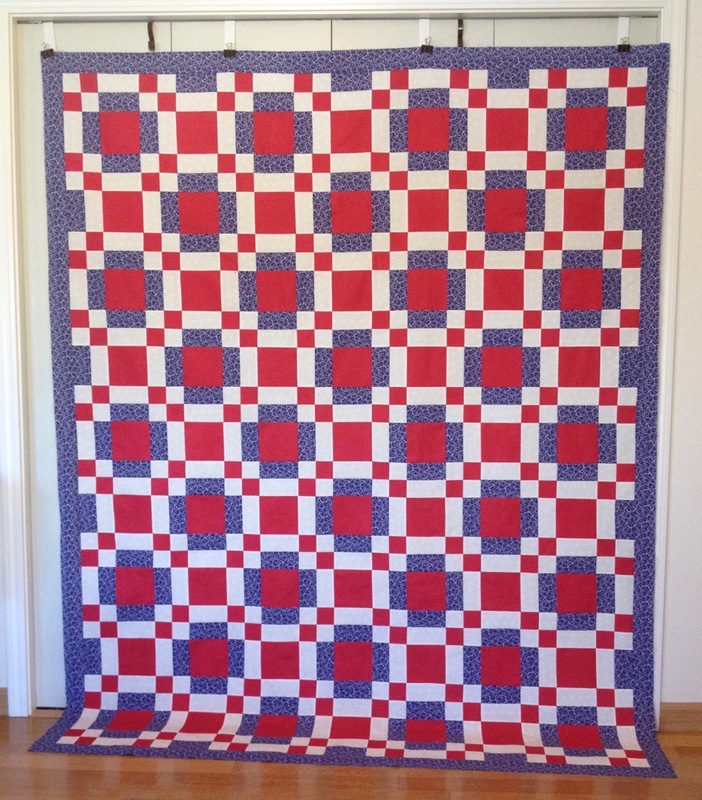 The blue fabric is gorgeous in this quilt, but I wouldn't have considered it in a fabric shop because it is so busy. However, it's the perfect fabric to balance the flying geese blocks. 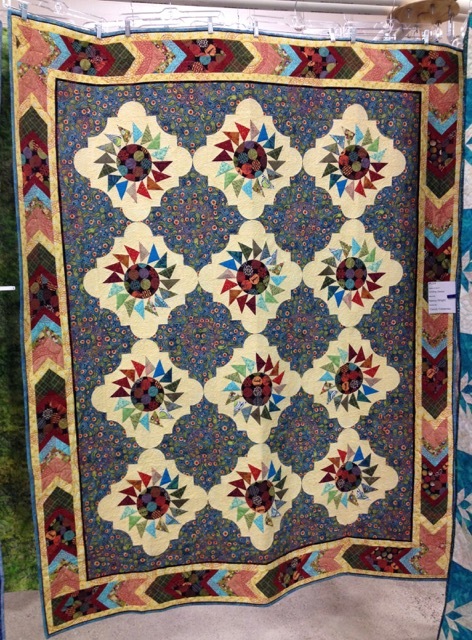 The braided border adds another layer of beauty to this stunning quilt. 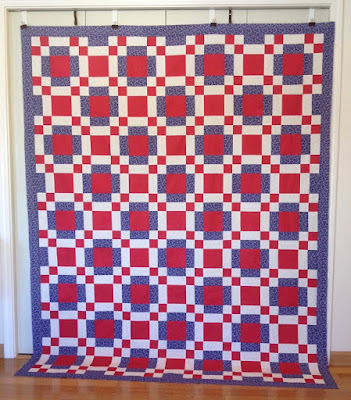 The kit I started at the February Quilt of Valor sew-in is finally finished, and the quilt is large. This quilt has an awful lot of red. If I made it again, I would use a different blue in the center of the blue framed blocks. American Hopscotch is Quilt of Valor #87 - a complete list of Quilt of Valor can be seen on this page. Another pair of single skein socks on the needles. This pair will definitely be fraternal twins. I like the grey yarn with the variegated yarn. 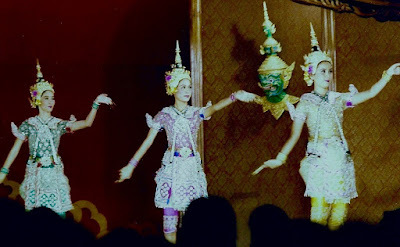 My tour group enjoyed an evening of authentic Thai food and entertainment when we were in Bangkok. 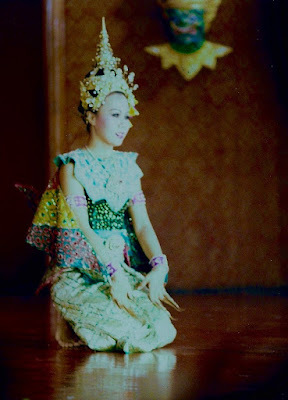 I apologize that the photos are a bit fuzzy, but I wanted to share the exquisite traditional dress that the dancers wore - such vibrant colors. 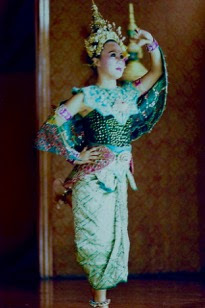 The fingertips that she is wearing are not clearly seen in this photo, but they looked like the ones that I found here. Earlier posts of Thailand can be seen here. I joined the Lander Knitting Social group on Friday evening to begin knitting the Brickless scarf. I've admired the scarf/shawl that my friends have knit and decided to join in the fun. 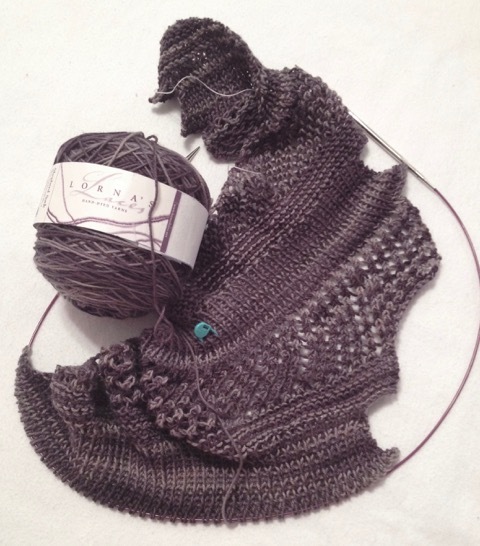 The pattern is written for worsted weight yarn on size 6 needles, so I started knitting on US size 4, but since my knitting tension is fairly tight, I frogged and recast on with US size 6. I like the feel and results a lot better. I hope the scarf/shawl is forgiving when it is blocked because some sections are kind of wavy. Thanks to Wyoming winters and my thyroid, I have extremely dry skin. To compensate, I've used mineral oil, gallons of lotion, and even vaseline. Nothing worked to relieve the dryness and the itch that accompanies it. 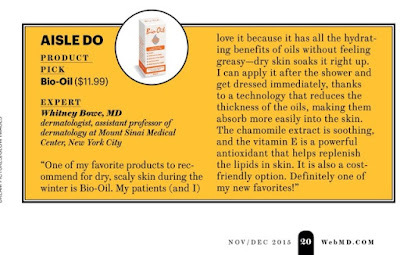 In November I saw the small box (pictured below) in a WebMD magazine, and thought the product was worth trying. 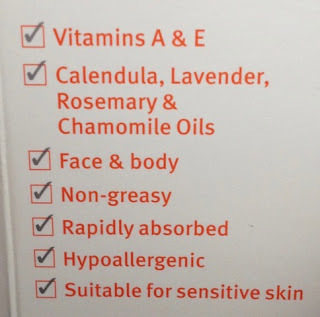 I especially liked the comment that it doesn't feel greasy. I found the Bio-Oil, shown in the top photo, at Walgreens (6.7 ounces was $21 on sale), and from the very first application, I was sold. It really isn't greasy, and I can dress soon after applying it to my skin. It doesn't stain my clothing. 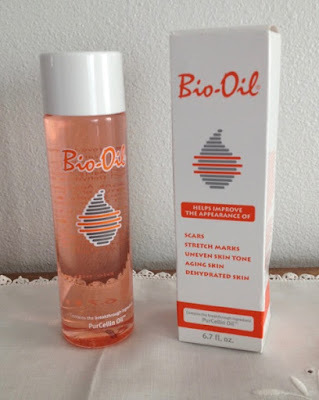 I don't use the Bio-Oil every day, but I could. I still use lotion periodically. If you know someone with dry winter skin, you might tell them to try this product. Note: I was not compensated for this review; I am a satisfied customer. 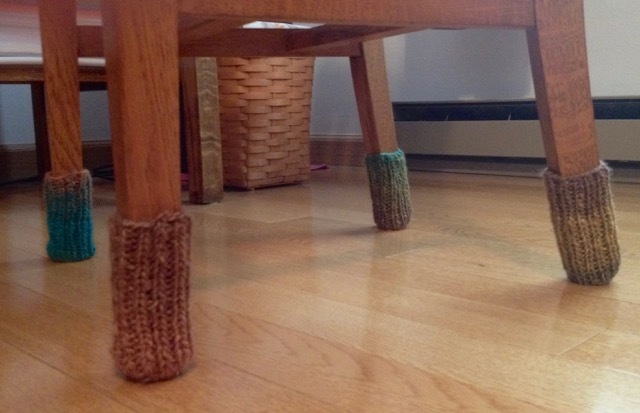 Despite the use of rubber bands on the purchased chair socks, they continually fell down. It was this sight that forced me to knit socks for my four kitchen chairs and now my desk chair. All the chairs that I use regularly now are decked out with new knit socks. 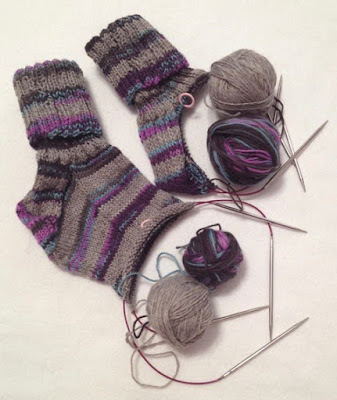 The desk chair socks were knit from Noro remaining from a previous project. 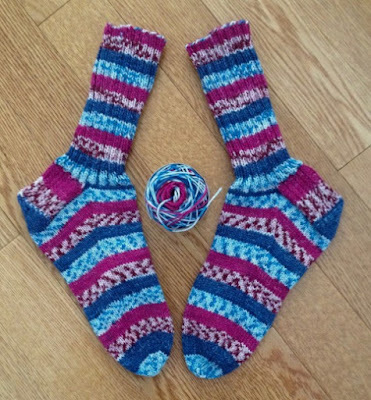 I have enough left to knit two spare socks. That will probably happen soon. 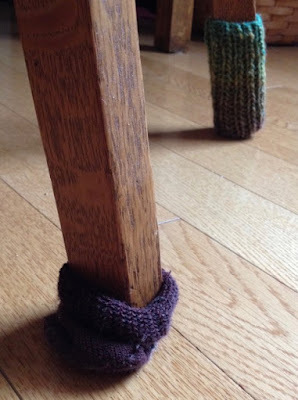 Knitting notes are included in the kitchen chair sock post. On the grounds of the Nelson-Atkins Museum of Art in Kansas City, MO are several large badminton shuttlecocks, and they were a delight to see on both sides of the museum. 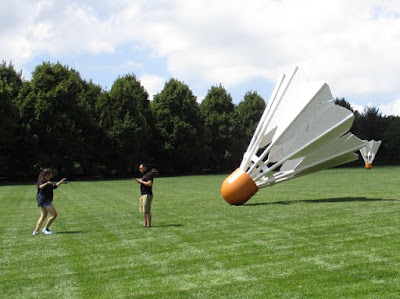 It appears that some giants were once playing badminton, using the museum building as the net, and simply left the shuttlecocks strewn on the expanse of grass. 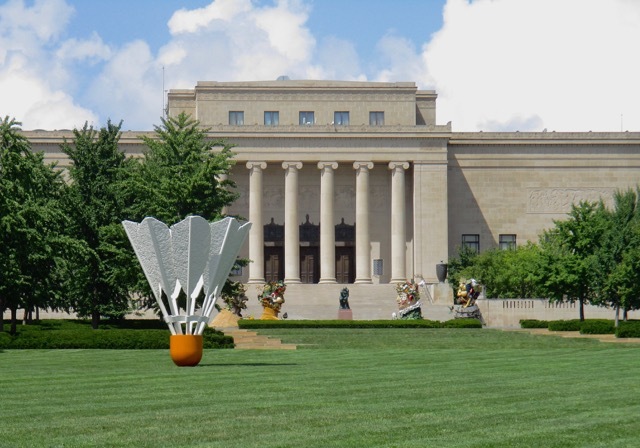 According to the museum website, these works of art were created by Claes Oldenburg and Coosje van Brugge in 1994. 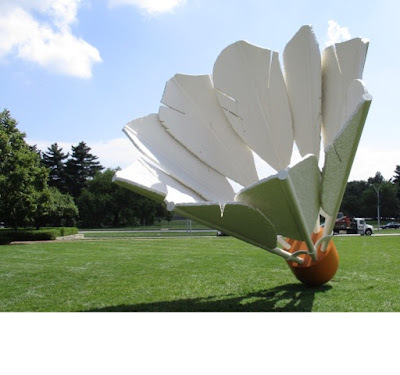 The sculptures are made out of aluminum, fiberglass-reinforced plastic, and paint. Each shuttlecock is 19 feet 2 9/16 inches high and 15 feet 11 7/8 inches in diameter and weighs approximately 5,500 pounds. I loved the chalkboard in this classroom and the box of "CHALK" on the teacher's desk. 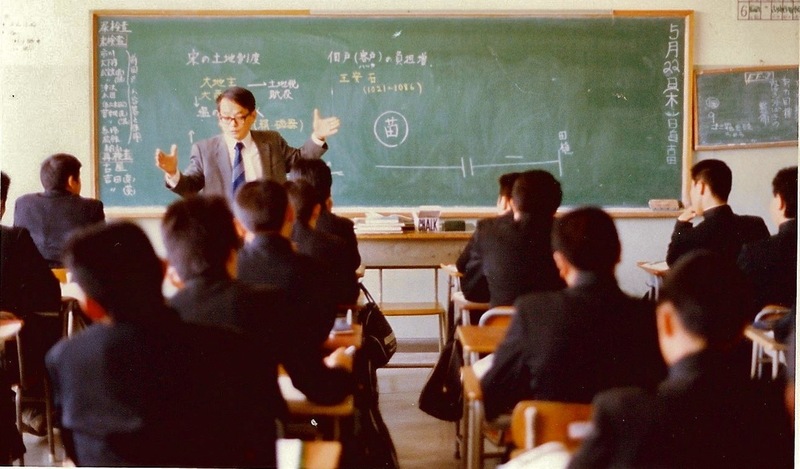 This teacher was obviously engaging because the students were forced on his lesson. Other photos from this school can be seen here. A Quilt of Valor (QOV) sew-in was held last Friday evening and all-day Saturday. On Friday, six individuals attended and began working on one of the available kits. I selected American Hopscotch and began working on the red and white strip sets. 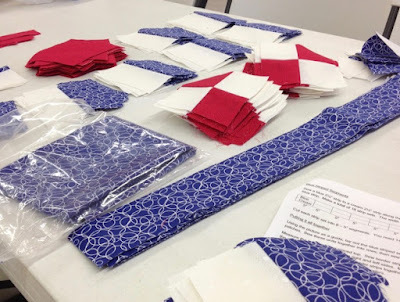 In three hours, I sewed, pressed, sub-cut, and sewed the red and white four patch units - 80 in all. Saturday was a full day and more sewists (eleven women and one man) attended and started working on their selected kits. I worked on the blue and white strip sets and sub-cut them into 143 five-inch units. One woman volunteered to press for everyone - what a luxury to just sew. I started assembling the units about 10 o'clock, and by two o'clock, I had nine rows assembled. By that time, my neck and back were aching, and even though the sew-in was scheduled for two more hours, I packed everything up and left. This QOV will be easy to assemble at home since all the units are made. 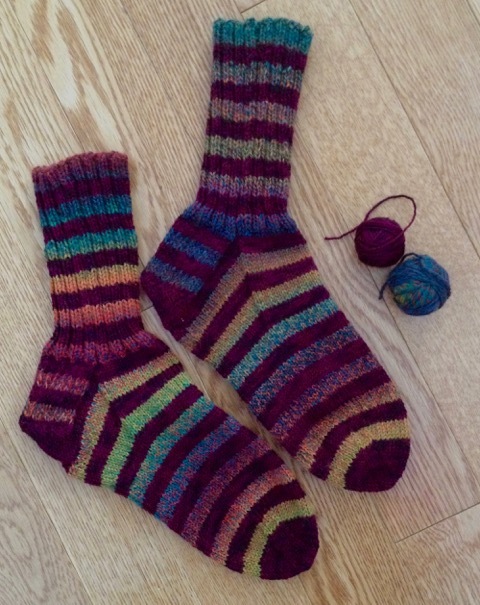 These were fun socks to knit - the striping was consistent throughout the yarn and resulted in matching socks without any fuss. Knitting notes can be seen on this earlier post. One ounce of yarn remains and will be adequate to knit a baby hat. I've debated purchasing a Veggetti for over a year, but when Kmart had one at a reduced price ($11), I bought it. Veggetti has quickly become an indispensable kitchen gadget, as it makes either thick or thin noodles. 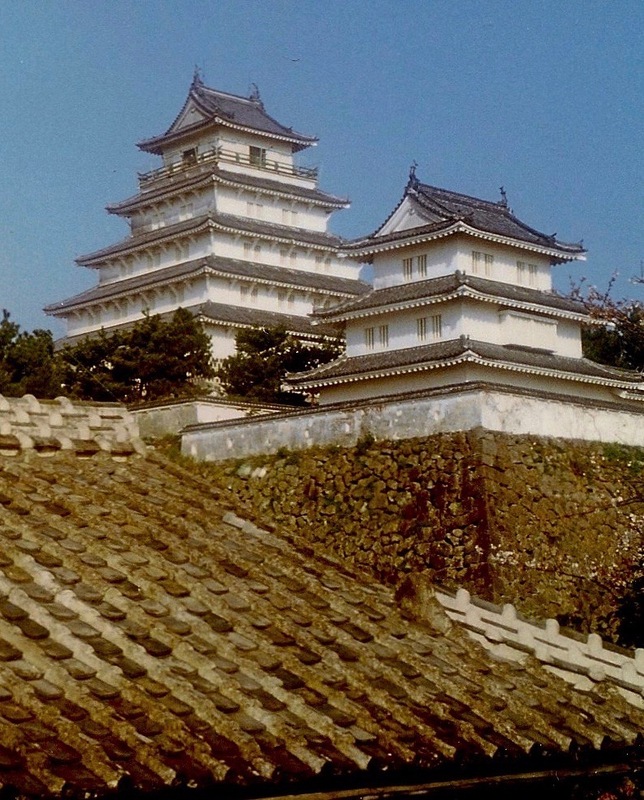 The photo above shows the thick option. 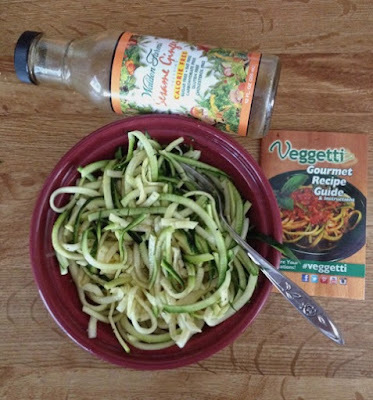 Zucchini "noodles" are now a favorite snack either raw or tossed with a bit of Walden Farms (no calorie) Sesame Ginger dressing, which gives the noodles a slightly oriental taste similar to stir fry. 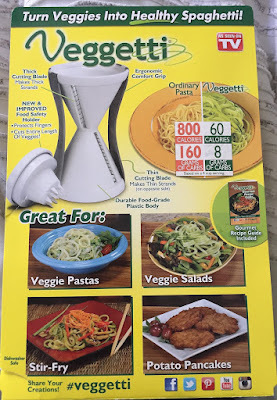 The instruction/cookbook that was in the package suggests using zucchini, yellow squash, cucumbers, carrots, and potatoes. I tried an English cucumber (it was more watery), but I didn't like it as well as zucchini. I doubt that I will ever use the device for potatoes; however, it looks like it making hash brownies would be pretty easy. The Veggetti is extremely easy to use and doesn't create a mess. Clean-up is easy, too. It is top-rack dishwasher safe, but I usually just rinse it under running water after using. 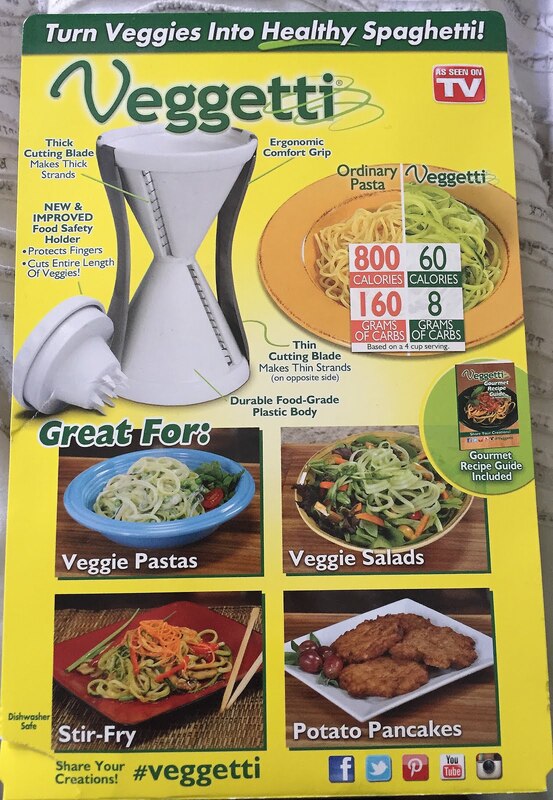 Have you tried the Veggetti? Did you like it? Note: I did not receive any compensation for this review: I am just a satisfied consumer. It's odd that the cuffs of the socks do not match, but the foot sections do. Knitting notes can be found on this earlier post. Two more skeins eliminated from the stash. The remnants (.5 ounces) will be used with other scraps to knit a scrappy baby hat. Other images of the castle can be seen here. About eight years ago, I purchased some "socks" for my kitchen chairs, and I was never happy with them: they wouldn't stay up and even with rubber bands, they slipped down around the "ankles" of the chair legs. I found several patterns on line, but the actually knitting did not occur until last week when I decided to use the scraps from the two Faroese shawls I just finished. The scraps were sufficient for sixteen socks - two chairs from each color. Cast on 24 stitches and knit 1x1 rib for 4 inches then begin decreases. The pattern is written from the "toe" up, but it was just too fiddly to begin with only four stitches, so I started with the top and knit down. I also shortened the socks because I thought 6 inches of ribbing was excessive - 4 inches was adequate for my chairs. Now, I plan to knit socks for my desk chair. 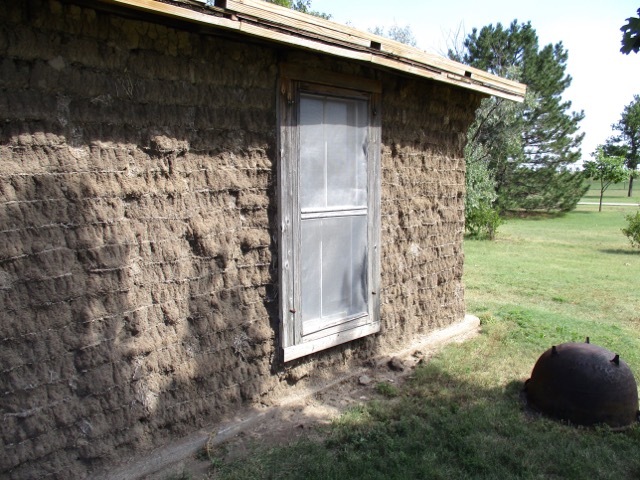 The sod house on the grounds of the Prairie Museum of Art and History in Colby, Kansas was built on site by volunteers. I was particularly interested in the exhibit because my maternal grandparents built and lived in a sod house. I always wondered what sod houses might look like on the inside and was surprised when I walked into the display house. The display home was cozy and inviting. I'm sure the depth of the windows is due to the thickness of the sod walls. While the display house had wooden floors, I assume many of the prairie homes had dirt floors. The sod house on display was one room and had few furnishings: a single bed, a bookcase, a trunk, a small dining table and chairs, a cook stove that also heated the house, a small pantry cabinet, and a washing machine. I'm guessing from the photo of my grandparents that they had a loft area for the children to sleep. Their soddie looks quite a bit bigger than the exhibit in Colby, Kansas. 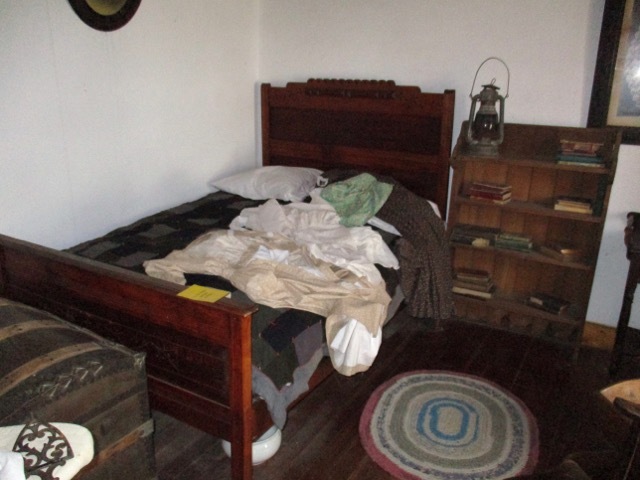 The Prairie Museum of Art and History has an Online Sons and Daughters of the Toddies Database with a gallery that is fun to browse. 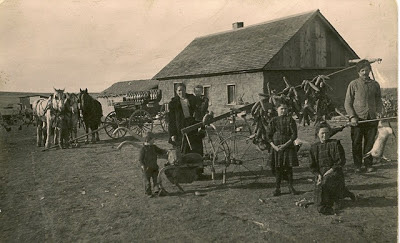 Did any of your ancestors live in a sod house on the prairie?